– MASSOB leader, Uchenna Madu has faulted Igbo leaders for being unable to defend the cause of the Ndigbo – He said the leaders did not have the good leadership qualities like the late Ojukwu – Madu said the group would soon embark on an internal revolution, starting with all Igbo leaders The Movement for the Actualization of Sovereign State of Biafra (MASSOB) has described Igbo leaders as cowards who are unable to defend the cause of the Ndigbo. The leader of the group, Uchenna Madu, blamed the leaders for the current deplorable plight of Igbo people, The Punch reports. He said this on Friday, November 4, at the national headquarters of MASSOB in Okwe, Onuimo local government area of Imo state during the 83rd posthumous birthday celebration of the Biafran warlord, Dim Chukwuemeka Ojukwu. According to him, the Igbo leaders lacked good leadership qualities like the late Ojukwu. Madu said: “Ndigbo have committed more harmful, dangerous and sacrilegious crimes against Igboland with their nonchalant attitude and selfishness against our ancestors. “Ndigbo have abandoned the legacies and visions of Dim Chukwuemeka Odimegwu, even his image, personality and name are no longer respected or regarded in the political, economical, social, traditional and religious lives of Ndigbo. Ojukwu and our ancestors are not happy with Ndigbo .” He stated that MASSOB would soon embark on an internal revolution in the south east, starting with all Igbo leaders. Madu maintained that successive governments in Nigeria had sternly marginalized Ndigbo. 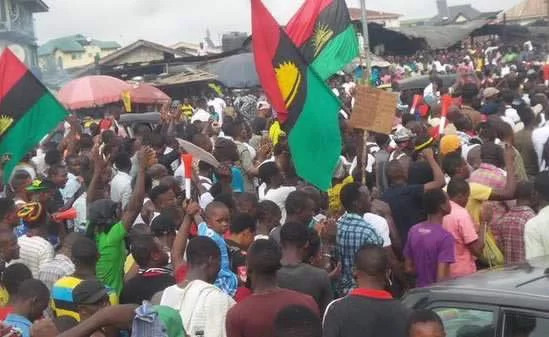 The MASSOB leader therefore, called on all Igbo leaders to work towards the advancement of the south east’s political, traditional, religious and economical emancipation from Nigeria’s anti Igbo policies of subjection.